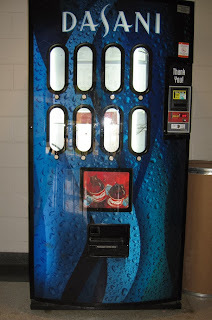 Unfortunately, not all vending machines are only filled with drinks. ...I swear they do. Everywhere I go, it is like I'm destined to come face to face with that traumatic waft of peanut wreaking anxiety I can't seem to get away from. I started taking a pastel portrait class with an amazing professor three weeks ago. At the second class, I SWEAR I smelled peanuts, but thought it was my OCD-level anxiety getting the better of me. I looked around after coming back from the break but could not find the culprit. I had mild hives that day but attributed it to my environmental ragweed allergy. The third week, everything went smoothly until I was at the vending machine outside the classroom and saw a bag of peanut-filled trail mix in the machine. I think I had a mild heart attack and had to take a few deep breaths because I now knew what I smelled was not my imagination. I walked back into the classroom and saw my teacher across the room eating a small bag of what looked like the same trail mix. My eyes narrowed like a hawk watching its victim from afar, but in this case, the victim was me and he didn't even know it. Yep, the unmistakable scent of peanuts began to fill the air and a knot was tightening in my stomach. Then, to my immediate horror, he walked over to me and began critiquing my chicken scratch. I could smell the peanuts from his breath with every breath I had to take, but I backed up slightly, literally freaking out over whether a tiny spittle of peanut protein would land on my face being I am a bit shorter. As he talked, I tried excruciatingly hard to listen, but my mind was so focused on survival that I really could not pay attention. Please don't pick up a pastel or touch my paper....please! No, the first thing he did was worse--he handed me the pencil he had been working with for the past ten minutes--then went on to show me something using one of my pastels. Now I was freaking out because I was holding a pencil likely FULL of peanut proteins, which made me want to run immediately to the sink. But what was I going to do about that pastel piece he was holding? Pastels are basically powder and pigment....they absorb oils...and I could not bring myself to throw it away because it is expensive! After he walked away, I literally felt like I was doing some sort of deep-breathing yoga exercise. It felt SO good to breathe. I immediately took the pastel piece he was working with and wiped it down thoroughly with a paper towel and went to wash my hands. I didn't say anything that day, but instead, went home after class praying I didn't have some sort of reaction. I did feel like I was going to have a mild hive reaction like the week before and also felt very itchy pin pricks a few times on my hands. I didn't say anything that day and I'll be honest, I'm ashamed. I should have. But today I did. I spoke to him briefly during the break and he apologized profusely. I did take precaution by emailing him before the class began about my severe peanut allergy, but people forget or don't realize that they cannot eat it in the same room. You have to keep watch at all times. Oh, yeah and I had to stop another student from walking towards me while eating that trail mix in class today, to which she quickly obliged saying, "Oh! I knew I should've gotten the Sun Chips!" and put the trail mix away. Not many people are this sensitive to it. They think if you are not reacting now, then its all in your head. I felt bad.....guilty, even, that I had to stop her from getting her blood sugar rush and I apologized profusely. This is something we live every day. My lesson you can learn from this? Keep watch over what products are being sold in the nearest vending machine at your school or workplace. You have to make sure you know what that yellow bag they are holding contains or the white and blue label on that candy bar! You want to be able to spot the colors from across the room so you can avoid unnecessary situations and keep yourself safe--after a certain age, it is not the responsibility of family to protect you, its up to you.